We hope this section helps answer a few of the questions you may have. 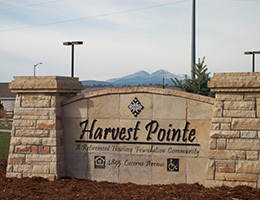 If you have a question not covered in this section, or if you would like more information, please call Harvest Pointe at (970) 622-9907. We look forward to hearing from you! Q: What type of housing is Harvest Pointe? Is it low income housing? 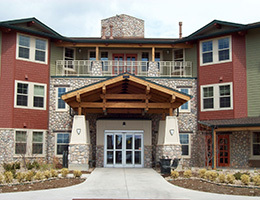 A: Harvest Pointe is a subsidized housing community for seniors age of 62 & over. The term “subsidized housing” means that the rent is based on income. A resident of the community pays approximately 30% of their income as rent. A: Monthly rental of the apartment, as well as hot water, & trash. A utility allowance of $ 44.00 is the allowance that is deducted off of the resident’s rent payment (meant to help the resident pay the utility bills). The allowance amount is based on average usage for the apartment and may change annually. Residents will still receive two utility bills (electric and gas) but the allowance is intended to help pay for these bills. Residents may still be eligible for energy assistance from the state. 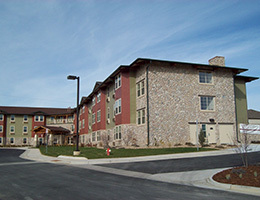 A: Harvest Pointe has 80 apartments. 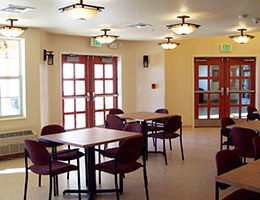 A: Harvest Pointe offers spacious one-bedroom apartments, all with accessible features, as well as a few more-accessible apartments for the sensory/mobility impaired. All are one-bedroom apartments and all are approximately 550 square feet. A: Yes, currently Harvest Pointe has a waiting list. Please call for the approximate waiting time. A: The Security Deposit is the same as one month’s full rent (plus the $ 44.00 utility allowance). This deposit is due in full at the signing of the lease. 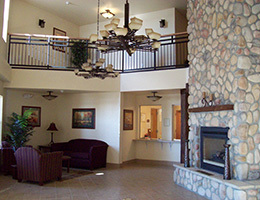 A: Harvest Pointe welcomes you to bring your pet along with you. Fish and birds are welcomed without a deposit. We also welcome a small dog or a cat with a pet deposit. There is a limit of one animal (cat or dog) per apartment and there are certain size and breed restrictions. A: The nonrefundable pet deposit is $300. Payment arrangements can be made for this deposit. Beginning with $50 and then a monthly payment of $10 until the deposit is paid in full. A: There is no additional storage available, however, each style of apartment offers some storage space (in the closets and small pantry area). A: Yes, there are two elevators located in the center of the building easily accessible by all residents, on all floors. A: Yes, Harvest Pointe offers its residents the use of a large parking lot. Q: What is the cost for parking? A: There is no cost for parking. A: Residents receive an apartment key, a key to a locked mailbox for their apartment, and an access key to the main entry (and the East & South entry). Our main entrance is intercom controlled and automatically opens with the key. A: Harvest Pointe prints a monthly calendar (& a Monthly Newsletter) showing the dates and times of various activities. Monthly activities include bingo, board games, pot-luck meals, seasonal activities such as gardening, and knitting/sewing for our Project HANDS program. 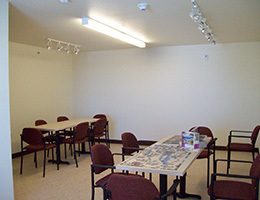 There is also a puzzle and craft room used daily for putting together puzzles and other various crafting projects. A: There is a laundry center at Harvest Pointe. This laundry center contains three coin operated washers and three coin operated dryers with folding and hanging areas and a wash sink for the convenience of our residents. The laundry room is located on the ground floor. A: There is a garbage center on each floor of the building specifically for garbage/recycling purposes. On the upper floors, there is a chute to dispose of trash directly into a dumpster. On the main floor, there are labeled bins for all recyclables. A: Yes, currently the city of Loveland has a couple transit services. These services stop at our door and take residents to the grocery store, doctor appointment, department stores, local restaurants, and other locations. More information on rides can be obtained from the Harvest Pointe Service Coordinator at (970) 667-1697.